The Ku Klux Klan (aka. 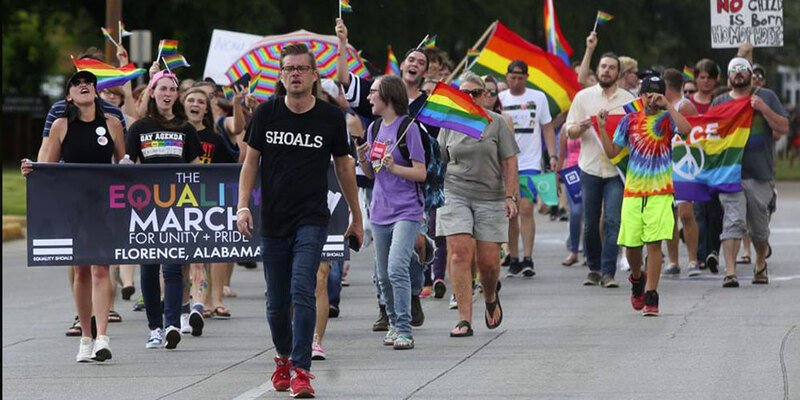 the KKK), the terrorist white supremacist group that has existed in America since immediately after the Civil War, protested a pride event on Sunday in Florence, Alabama, a city of 40,215 people in the state’s northwest corner. In two separate Facebook posts published during the event, the Florence Alabama Police Department (FAPD) said it was their “duty and honor to provide security and ensure the safety of both groups” and used the hashtag #DefendersOfTheConfederateCross, a reference to people who support the confederate flag. Approximately 400 LGBTQ people and allies attended the Equality March for Unity and Pride on Sunday, an event which marked the city’s first-ever pride commemoration. 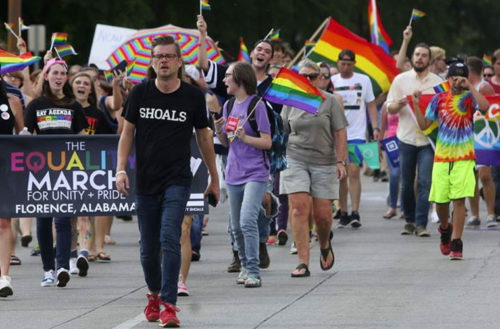 It was organized by Equality Shoals, the area’s newly formed LGBTQ organization, and was intended as a sister march for the Equality March happening at the same time in Washington D.C.. According to Equality Shoals, about 10 to 12 KKK members protested the march at its starting and ending point at Wilson Park in downtown Florence. Some of the KKK members wore Klan robes, insignias and brought a KKK flag, a Christian flag and a Saint Patrick’s Saltire flag (a white flag with a red diagonal cross denoting Irish nationalism). Though the FAPD monitored the KKK presence and noted no violence or arrests, their Facebook posts published during the event have raised some eyebrows. The first post used a hashtag that seemingly referred to the KKK as “Defenders of the Confederate Cross,” an apparent reference to the confederate flag, the battle flag flown by the southern pro-slavery states during the Civil War . While some supporters of the Confederate flag argue that the flag symbolizes “heritage, not hate,” a recent historical study by The Washington Post determined that the flag largely came back during the 1960s Civil Rights era through use by white supremacists who flew it as a symbol of their opposition to racial integration and black civil rights. It is unclear whether the KKK applied for a protest permit at the park.